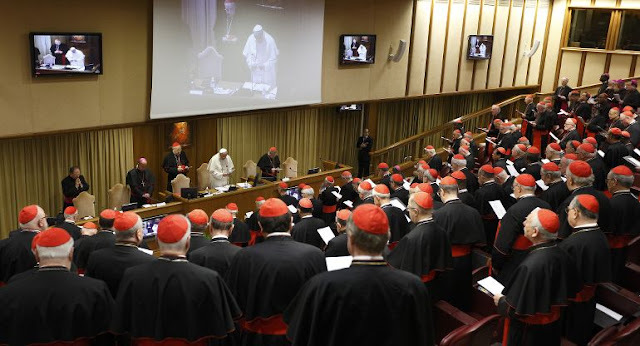 Catholic News World : FULL TEXT - Suggested Changes to Synod Document with Moderator Card. Gracias "threefold experience of Church - as ‘mystery’, ‘communion’ and ‘mission’." FULL TEXT - Suggested Changes to Synod Document with Moderator Card. Gracias "threefold experience of Church - as ‘mystery’, ‘communion’ and ‘mission’." The Holy Spirit is rejuvenating the Church through this Synod. Holy Father, when you were at World Youth Day in Kraków, you asked the young people several times, “Can we change things?” Again and again their answer was a resounding “Yes!” In calling this Synod, you reminded us that young people are in your heart and in the heart of the Church. Led by the Spirit you have brought us on a ‘synodal journey’ for almost two years, leading to this graced month of discernment for the bishops of the world. In a curious reversal of roles, it is the young people here present who have accompanied us, helping us to scrutinise ‘the signs of the times’ and to discern, ‘in the light of the Gospel’ what the Holy Spirit is saying to the Church. Our Group felt that this synodal journey should not end here; in many ways we are beginning a new phase, as we journey home bringing with us the insights and ideas we have learned here, tasked with sharing them with our episcopal conferences, dioceses and parishes. In doing so, we might seek to mirror for our particular churches at diocesan, regional and national levels, the methodology of : “Recognise”, “Interpret”, “Choose”. What has the Holy Spirit been saying to us at this Synod? It is clear that our young people are being called to holiness- as married or single people, as priests or consecrated persons. They are being gifted with charisms, through Baptism and Confirmation, to embrace their unique role in the new evangelisation. If we are to truly value their contribution at local level, then we must share best practice to support the pastoral activities that will strengthen the connections between Church and the young. We must ‘go the extra mile’ to be present in the complex realities of their lives. During the synodal process, inspired by the Holy Spirit, we have identifiedthe need for ‘a preferential option’ for our young people. 2. Renewed encouragement for our Catholic schools and universities, for quality teacher formation and vibrant chaplaincies; (after all, as Pope Francis has said, “to educate is an act of love, it is to give life”). 7. Active participation of youth in liturgy, in Associations, Movements, basic Christian communities and in all Church activities, including in consultative and decision-making roles. In short, we are talking about the re-imagination of parishes and structures so that young people are heard, listened to, appreciated and encouraged. The goal of this work is to offer to them, as Christifidelis Laici puts it so beautifully, a threefold experience of Church - as ‘mystery’, ‘communion’ and ‘mission’. Many of us arrived at this Synod believing that it was about pastoral ministry TO young people - particularly given the many challenging situations they face throughout world - from poverty and persecution to violence and human trafficking, migration, their vulnerability on social media, their compulsions and addictions, their loss of bearings and their longing for stable reference points and a sense of direction and purpose in life. The Synod has allowed us to reflect on all these things and about how we might reach out to our young people, who sometimes seem “harassed and dejected, like sheep without a shepherd”. But the Spirithas also reminded us strongly at the Synod that young people are not simply the OBJECTS of our evangelisation and pastoral ministry; they are also the AGENTS of evangelisation to each other and, indeed, to the whole Church. With proper formation and accompaniment, our young people can be the missionary disciples who will bring thelight of faith to their peers and even to those who are far away from Church. As this Synod put it, they are PROTAGONISTS, called and gifted by the Spirit in their own right to be active participants in the new evangelisation. As volunteers at home and abroad, they can be missionary disciples among the poor, agents of social action, advocates for the protection of Life, builders of a civilisation of love, contributors to ecumenism and reconciliation, apostles to young migrants, leaders and advocates in addressing grave issues like human slavery and trafficking, and, carers for our common home. The call to holiness of these young ‘protagonists’ includes an invitation that they might transform temporal society - their world of media, politics, the digital highways, business, commerce and healthcare - transform, from within, with the values of the Gospel and the merciful love of God. Our Group discussed extensively the challenges and questions surrounding the Church’s vision of the body and human sexuality. We have offered a modus to paragraph 197 on this issue which seeks to present the Church’sbeautiful, yet challenging, vision, teaching and anthropology of the body, sexuality, love and life, marriage and chastity. At the same time, we restate the Church’s opposition to discrimination against any person or group, and Her insistence that God loves every young person, and so does the Church! Holy Father, in your recent visit to Ireland you visited and prayed at the shrine of Our Lady of Knock, Queen of Ireland. Almost forty years ago Pope St John Paul II said there: “Every generation, with its own mentality and characteristics, is like a new continent to be won for Christ”. This Synod has reflected on the concrete realities of this new continent, and of this new generation of young people. During interventions in the Aula and via the debates in the discussion groups, the Spirit has revealed to us that the greatest resource in winning this new generation, this new continent for Christ, is our young people themselves. Why should we be surprised at this, since God chose from among the sons of Jesse, David, the youngest, the shepherd boy, and bestowed his Spirit powerfully upon him? Why should we be surprised that God might again be choosing the youngest of his faithful as his ‘champions’ to confront the giant ‘Goliath’ challenges in today’s world? Through this Synod, God has opened our eyes to see that it is our young people who are his chosen instruments. They are co-responsible with all of us for changing the world. We must be careful not to block the rejuvenating work of the Holy Spirit! On the contrary, our role is to facilitate it - to ensure that young people are formed and accompanied in the love of Christ by authentic guides and mentors, that they are schooled in prayer and sound catechesis, challenged to go out of their comfort zones to meet their peers in the peripheries, and strengthened by the witness of young saints and martyrs to endure setbacks, knocks and even persecutions for their faith. As this Synod draws to a close we might ask once more, as Pope Francis did at Kraków: “Can we change things”? The Synod has helped us, by the grace of the Holy Spirit, and with the infectious joy and support of our young people, to answer confidently: “Most certainly, Yes!